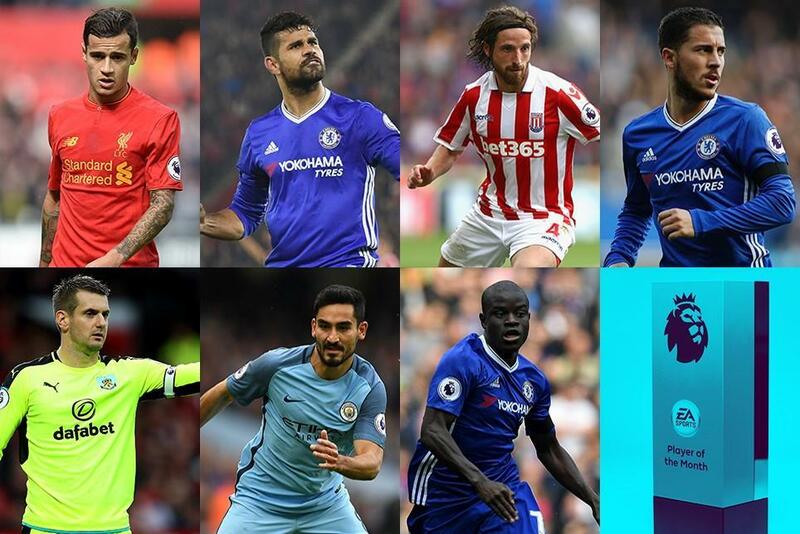 With competition stiff after a compelling October of Premier League football the public can help to choose who wins the EA Sports Player of the Month award. After an exceptional month for Chelsea, Antonio Conte's side boast three of the seven nominees for the monthly accolade in N'Golo Kante, Eden Hazard and Diego Costa. The others to make the cut are Burnley goalkeeper Tom Heaton, Stoke City midfielder Joe Allen, Liverpool's Philippe Coutinho and Ikay Gundogan, of Manchester City. The vote for October's winner will close at 23.59 GMT on Monday 7 November. Because of the international break, the winner will be announced on Friday 18 November. The England goalkeeper played a major part in Burnley's revival in October, making 31 saves to take his season's tally to 57, 21 more than his nearest rival. Eleven came in the match at Old Trafford where Heaton defied all that Manchester United could throw at him. An ever-present in October, Kante has been the linchpin of Antonio Conte's new 3-4-3 formation. As well providing the team a defensive solidity that meant they did not concede in October, Kante laid on six chances for team-mates, completed 247 passes and scored a memorable goal against Manchester United as Chelsea won four matches out of four. If Kante has been Chelsea's driving force, and Hazard the wizard on the wing, Costa has represented Chelsea's cutting edge. The Spain forward maintained his early-season form, scoring three goals as well as providing an assist, to take his tally to an unrivalled eight for the season. Coutinho continued to shine brightly in Liverpool's exciting attack throughout October. The Brazilian was at the heart of everything, laying on 13 chances for team-mates, completing 14 dribbles and 92 passes that finished in the final third, He also scored a wonderful goal, his fifth of the campaign, against West Brom.